Try these clever gift toppers for travel to help your packages arrive at their destination in better shape. Carrying wrapped packages while traveling is difficult. And usually the bow or other gift top gets crushed in the process. If you are using a package decoration that might crush, turn a small cardboard box upside down over it to protect it. Try some of these unique and interesting package toppers for crush free travel. They’ll look as good at the end of your trip as they did at the beginning. These ideas will also work well on gifts that are being mailed to another destination. You can add packaging peanuts or other fillers without damage to your finished gift. Craft foam Christmas tree decorations look festive tied to the top of a gift, and craft foam doesn’t crush easily. Cut 2 identical shapes from a brown paper bag. 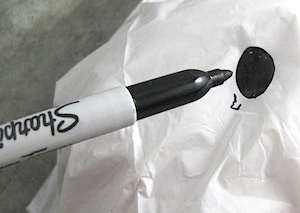 Color with markers and glue together around the edges, leaving a space for stuffing with cotton or shredded paper before finishing. Punch a hole in the top and you can attach it with ribbon, twine, or yarn. A clever idea for gift toppers for travel (either mailed or carried) is to use yarn or twine wrapped several times around the wrapped gift and tie with a large, colorful tag. Cut strips of fabric with fancy scissors and layer them around a package. Wrap colorful yarn around the middle of the fabric and tie in a bow. Yarn is pretty much uncrushable, and the fabric lies flat. Perfect for a traveling gift. Make a buckle in any shape by cutting two slits wide enough to accommodate the ribbon you are using. Slide the ends through the slits and pull to tighten. Another buckle trim idea uses glitter. Make felt ornaments that can be used to decorate the tree after the gift has been opened. Craft a button star with felt and a button or two. 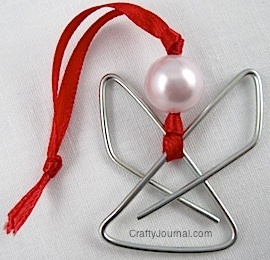 Use to decorate a small gift, or make a larger star for a larger gift. The star shown is used on a card, but would be very nice on a gift. These felt bird brooches could be used as pins after the gift is opened, or just used as gift tie-ons. Blanket stitch around cut pieces of felt to make a cute felt birdie to perch atop a package. Craft a flat folding pinwheel using designer paper or coordinating wrapping paper to attach to the top of a gift. Or use 2 or 3 pinwheels. Fold some colorful tags to make a flat folded tag flower. Since it’s already flat, it won’t be crushed. Tie your gift with yarn or string and attach an antique brooch or a badge for a different look. This clever recycled bow is made with a strip of aluminum from a recycled can. Using these clever gift toppers for travel will help your present get to its destination in a happy condition.